MBC Solutions specializes in complete design and implementation of Peachtree, Sage 50 and QuickBooks accounting systems. Unfortunately there is much more to accounting software than purchasing it and loading it on your PC; although the software companies would have you believe this is true. 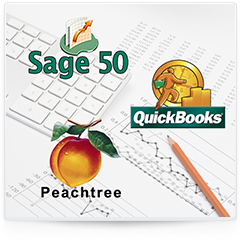 We can help with your Peachtree, Sage 50 and QuickBooks accounting software. John Maros, president of MBC Solutions, LLC, started specializing in Peachtree and QuickBooks financial and accounting software solutions in the Scranton / Wilkes-Barre area in 1989. Mr. Maros has a Bachelor’s degree in accounting and understands Peachtree, Sage 50 and QuickBooks accounting software and what it takes to keep small to medium sized businesses running smoothly. We have been working with Sage 50, Peachtree Accounting, QuickBooks, Quicken, Axapta, Navision, MAS90 and a host of other popular financial and accounting software packages in the Scranton / Wilkes-Barre area since 1989. Our combination of accounting know how and computer proficiency allows us to help you automate your business easily and painlessly. We do much more than just load your Peachtree, Sage 50 or QuickBooks accounting software. We can help you with actual setup, acounting structure, implementation, training and utilization of your Peachtree, Sage 50 or QuickBooks accounting software. So whether it be setting up your system or acting as a liaison between your accountant and yourself, we are confident our services will benefit you. We would be happy to meet with you free of charge yo go over your accounting software needs and make sure you are heading in the right direction.